The great ones don’t age. 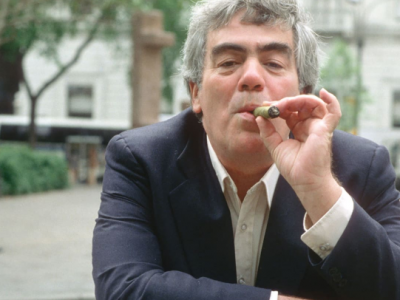 You can pick up almost any Jimmy Breslin column from his prime and it reads clean. The punches land with precision. He’s fearless. Funny as hell. And he can break your heart. Line up your Pulitzer Prize winners for commentary, the Oscars of the columnist world, and not all of the other honorees fare as well. Some are stuck in the amber of self-importance or talk in jargon about political fights that fade with time and distance. But Breslin managed cinematic scope whether writing about forgotten men or fallen presidents. His most iconic column, “It’s an Honor,” did both. While every other reporter in November of 1963 was covering JFK’s funeral, Breslin famously refused to be part of the pack. He called on the home of a man who dug graves for $3.10 an hour at Arlington Cemetery for a living, and captured the moment when Clifton Pollard answered the phone at his home one morning. The one that made me realize that newspaper columns could be art, though, came from the other end of that marathon of misery, a masterpiece called “A Death in Emergency Room One.” Breslin recounted the day of Dr. Malcolm Perry, who was on call when the call came in at Parkland Hospital in Dallas, and fought to save Kennedy’s life. I fell in love with Breslin’s work from a distance. I wasn’t part of the generation of journalists that came up in his shadow, unwisely wanting to be the next Breslin. I was too young to even grow up reading him in his prime in the newspapers. Instead, I discovered him in dusty anthologies bought in used bookstores. His recurring comic characters like Fat Thomas and Marvin the Torch were so surreal they seemed made up, but they were real characters from Queens. The unflinching eye for detail made sense when I found out later, while interviewing Breslin for a segment on Reliable Sources, that he’d studied painting as a young man. It’s always seemed to me that most writers are either frustrated painters or musicians. The musicians write for the ear. The would-be painters write for the mind’s eye, and they’re better for it. But I could never totally understand how this rumpled, raving genius was, by all accounts, almost comically rough in person. He did not suffer fools and could treat even friends with a razor’s edge. But he was unapologetically himself and he cared about telling other people’s stories with a dignity they were often denied in daily life. Breslin’s outsize talent made him a celebrity newsman in ways that we can only imagine today. He ran for City Council president on a mayoral ticket with Norman Mailer, hosted Saturday Night Live, starred in raucous TV ads for Piels Beer, and his mythic status was a plot point for Bruno Kirby’s character in When Harry Met Sally. When we did the Deadline Artists anthologies, we got a ringside seat to judge the columnist competition across the decades. H.L. Mencken and Ernie Pyle may have more outsize reputations. Dorothy Thompson and Westbrook Pegler’s massive talents have faded from the public mind. Molly Ivins and W.C. Heinz still puncture the darkness brightly. In terms of consistency, Mike Royko and Murray Kempton came closest in their prime. But for my money, Jimmy Breslin was the greatest columnist who ever lived. This entry was posted in Featured Columns and tagged Deadline Artists, The Daily Beast. Bookmark the permalink.